KATHMANDU, Aug 5: The United Kingdom's ambassador to Nepal Richard Morris, along with Gail Marzetti, head of the Department for International Development (DFID) Nepal today called on the newly elected Prime Minister of Nepal Pushpa Kamal Dahal at the latter's private residence in Lajimpat. KATHMANDU, Aug 5: A Cabinet meeting held in Singha Durbar on Friday decided to provide Rs 1 million each to the families of those killed during the Madhes Movement. KATHMANDU, Aug 5: The Nepal Student Union (NSU) – a sister wing of the Nepali Congress – has set the age bar threshold for election in its organization at 32 years. 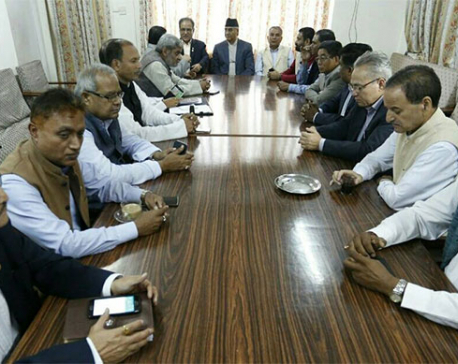 KATHMANDU, Aug 5: A Cabinet meeting on Friday is providing martyr status to those killed during the Madhes Movement, compensation to the families of the victims and treatment to the injured. CHITWAN, Aug 4: Whether or not the outgoing Oli government has met people’s expectations during its tenure, it has certainly left Swami Kamalanayanacharya a pleased man. 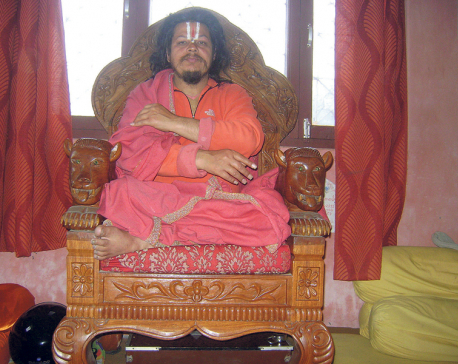 Just ahead of stepping down, it decided to free a huge portion of land covered by the so-called spiritual guru’s arshram from the authority of Chitwan National Park (CNP). KATHMANDU, Aug 5: Commission for Investigation of Abuse of Authority (CIAA) chief Lok Man Singh Karki has been dillydallying over acknowledging a show cause notice issued by the Supreme Court in a contempt of court case. KATHMANDU, Aug 5: Prime Minister Pushpa Kamal Dahal assumed office on Thursday after taking oath of office and secrecy from the president earlier in the day. KATHMANDU, Aug 5: The Supreme Court has once again reminded the Commission for the Investigation of Abuse of Authority (CIAA) of its jurisdiction and issued an interim order not to overstep that jurisdiction. KATHMANDU, Aug 4: Seven professors at the Institute of Medicine (IoM) on Thursday registered a writ petition at the Supreme Court demanding annulment of the 'illegal order' issued by the Commission for Investigation of Abuse of Authority (CIAA) to Tribhuvan University to take action against them. KATHMANDU, Aug 4: Assuming the office of prime minister on Thursday, Prime Minister Pushpa Kamal Dahal has announced that his government would launch a special campaign entitled “the government for poor” with programs related to livelihood, education, health, insurance, technology transfer, employment, self-employment, integration of local market and banking and food security.